Each month, the best new iPhone apps—and some older ones—are considered for admission into Gizmodo's Essential iPhone Apps Directory. Who will join? Who will live? Who will die? 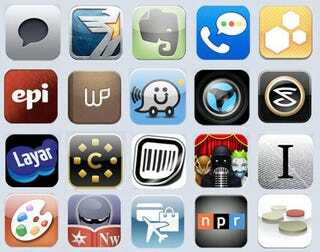 For the full directory of Gizmodo's Essential iPhone Apps, click here. As gathered from our weekly roundups. If you hate hate hate galleries, click here for a single post. • I Am T-Pain: This app was fun when it first came out, but now that you can sing over your iPod library, it's priceless. • Waze: Because it's getting to be good enough to depend on (in a few areas), because it's free, and because their video-gamey plan to make the app better is totally charming. • Voices: Because when your iPhone isn't acting as a tool, it's a toy. And everyone loves some good voice modulation. • Snapture: Because full 3GS support, which Snapture recently added, was the only thing holding this app back from replacing the iPhone's camera completely. • ShopSavvy: Because any iPhone decent a good, free barcode scanning app. This is one of the best barcode apps for Android, and now it&apos;s available on the iPhone. • Chorus: Because finding new apps is hard, y'all. What counts as an essential iPhone app changes all the time, and so should our guide: If we've missed anything huge, or you've got a much better suggestion for a particular type of app, let us know, or say so in the comments. We'll be updating this thing pretty frequently, and a million Gizmodo readers can do a better job at sorting through the app mess than a single Gizmodo editor. Enjoy!